Hao Li and his company, Nanova Biomaterials, Inc., recently received approval from the Food & Drug Administration to market and sell their nanofiber-reinforced flowable composite, NovaPro Flow, which will be used for dental repairs, namely restoration fillings. Credit: Nanova Biomaterials, Inc. This video is available for broadcast-quality download and re-use. A closed caption video is also available. For more information, contact Nathan Hurst at HurstN@missouri.edu. COLUMBIA, Mo. –Dental composites are the synthetic resins or mixtures dentists use to restore teeth to their original hardness and rigidity. Made of amalgams—mixtures of mercury, silver or tin, or composites such as silica, ceramic or plastic compounds—longevity and performance often vary, and the composites are prone to breakages. Now, a University of Missouri engineer who has developed a “flowable” composite that can be injected in a cavity and hardened through a high-intensity light, recently received clearance from the Food and Drug Administration to produce this product on a commercial scale. Because of the short life span of normal composites, it is estimated that replacement fillings comprise 75 percent of a dentist’s work. Additionally, the short life span of everyday composites is one of the most critical challenges for restorative dentistry, according to the National Institutes of Health (NIH). Hao Li, a professor of mechanical and aerospace engineering in the MU College of Engineering, and president of Nanova Biomaterials Inc., created a composite using calcium phosphate nanofibers that significantly improves the strength of the tooth while retaining the shine. NovaPro Flow, which is a composite that incorporates nanofiber technology, is applied as a liquid composite through a syringe and can be easily and precisely delivered to the teeth of a patient. Once the composite is fitted to the cavity properly, it is cured with a blue light, which causes the composite to hardening less than 20 seconds. Once hardened, the nanofibers provide support to the overall structure ensuring greater longevity, much like rebar in concrete. Funding for the research was provided by Li’s 2009 National Science Foundation CAREER award, which totaled $430,000, and another $410,000 NIH grant. A Chinese venture capital firm, SummitView Capital, provided additional funding for mass production and the lengthy FDA clearance process as part of its more than $7 million investment in the company. Li also is working on gaining FDA approval for more nanofiber-based biomaterials, including universal dental composites. The company already has produced a dental varnish, StarBrightTM. NBI opened its Columbia facility in 2013, where it currently manufactures all of its innovative nanofiber products. 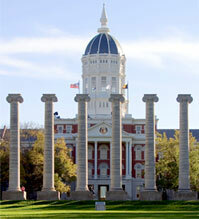 Li’s work also showcases the role the University of Missouri plays in economic development for the state. The MU Office of Economic Development works to build strategic collaborations to grow research and service contracts; enhance internships, experiential learning opportunities and job placements; develop long-term philanthropy collaborations; explore collaborations for new funding opportunities; and accelerate entrepreneurship and commercialization to advance the growth of local, state and regional economies.